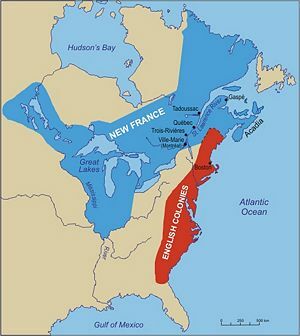 New France was the territory of North America acquired by France, during the Age of Exploration. The territory stretched from Hudson Bay to New Orleans, with the seat of government based in Québec. The French colony existed from 1655 to 1763, when Britain took over and created the colony of Canada. The legacy of New France continues to this day, with a significant portion of the Canadian population being descended from about 10,000 of the original settlers. New France was colonized by France from the exploration of the Saint Lawrence River by Jacques Cartier in 1534. At its peak in 1712, the territory of New France extended from Labrador to Lake Superior and from the Hudson Bay to the Mississippi River and the Gulf of Mexico, and included much of what is now eastern Canada. The territory was then divided in five colonies, each with its own administration: Canada, Acadia, Hudson Bay, Newfoundland and Louisiana. About 16,000 French settlers came, of whom about 10,000 concentrated in farming villages along the St. Lawrence River. The French government formed alliances with some of the Indian tribes, who helped the fur trappers extend their activity throughout the Great Lakes region. With France and Britain often at war, New France was frequently at war with the British colonies to the South. The area around New Orleans and west of the Mississippi passed to Spain, which ceded it to France in 1803, allowing France to sell it as the Louisiana Purchase to the United States. The first European explorer to reach New France was Jacques Cartier; he was commissioned by the king of France to "discover certain islands and lands where it is said that a great quantity of gold, and other precious things, are to be found." Sailing into the St. Lawrence River in 1534, he planted a cross in Gaspé, giving France control over what would become Nouvelle France, its North American colony. Travelling up-river, Cartier established a settlement at Stadacona, near present-day Quebec City. The settlement was not viable and was soon abandoned. In 1602, King Henry IV of France gave a monopoly of the Canadian fur trade to a Rouen business group. This charter company, the first of several that were to rule New France for the next 60 years, appointed Samuel de Champlain chief agent for its overseas adventure. Champlain possessed qualities that were needed for the founding of New France. Ardently religious, he was, like the king himself, a Catholic with a Protestant background. Adventurous, a skilled seaman and cartographer, Champlain was also patriotically eager to help expand French power in the new imperial age. In 1608 Champlain sailed up the St. Lawrence to Cape Diamond, where he built the fur-trading fort of Quebec. From there, Champlain began to explore and map systematically the whole upper St. Lawrence region from Georgian Bay in the northwest to Lake Champlain in the south. In order to maintain friendly relations with the local Algonquin and Huron Indians, who controlled the fur-trading routes to the interior, Champlain was also forced to support them in their bloody feud with the Five Nations of the Iroquois confederacy. As a result, the Iroquois aligned with the Dutch and English to the south and became implacable and dangerous enemies of the French. Trappers and woodsmen such as Etienne Bruléand Jean Nicolet pushed further into the interior. Known as coureurs-de-bois, they extended both the fur trade and French imperial claims as far as the headwaters of the Mississippi. Their success encouraged the charter companies to concentrate on the fur trade rather than build a solid agricultural base in the St. Lawrence Valley and induced many intrepid young colonists to leave the settlements and became coureurs-de-bois. Moreover, with France involved in the Thirty Years War (1618-1648), little encouragement or support was sent to New France. What settlement did occur after Champlain's death (1635) was controlled by the Jesuits (Society of Jesus). Inspired by the missionary spirit of the Counter-Reformation, they sought to convert the Indians to Christianity and to keep New France Catholic. Traveling with the coureurs-de-bois, Jesuit priests established missions as far west as Georgian Bay. Under François Laval, who was named head of the colonial Church in 1659 and Bishop of New France in 1674, Protestants were not permitted to settle in Canada. This policy strengthened a feeling of common purpose and even a nascent nationalism in New France. Because of their involvement with the French fur trade, the missionaries were exposed to attacks by the Iroquois, who were allied with rival Dutch traders in the Hudson River valley of New Netherland. The Jesuits were successful in converting the Hurons, who trapped most of the furs. In 1648 the Iroquois, seeking to wipe out the Hurons and divert the flow of furs to the Dutch at Fort Orange (now Albany, New York), invaded the Huron country and massacred its inhabitants. Father Jean Brébeuf and several other Jesuit priests were tortured and burned at the stake, martyrs to the cause of Christianity and French Canada. The Iroquois then moved on the centre of New France. Montreal, which had been founded in 1642 on an island in the St. Lawrence river, had become the principal control centre for the interior fur trade. It was repeatedly subjected to Iroquois harassment, and its defence to the death by men like Adam Dollard gace it legendary heroes. In 1663 King Louis XIV nationalized the private fur-trade monopoly. He made New France a royal province with a superior council to carry out the king's edicts. Three officers dominated the council: the governor, with responsibility for defence; the intendant, to administer justice and promote economic growth; and the bishop, who wielded great power through his control of the church. Despite chronic feuding, conciliar government proved efficient. Under the leadership of dedicated intendants such as Jean Talon, the first to hold the office, New France began to flourish. Population grew from 2,000 in 1663 to 6,000 in 1672. In addition, nearly 1,000 members of the veteran French regiment, the Carignan-Salières, were sent in to protect the colony, and many remained permanently. Talon's encouraged large families, domestic industries, and stable farming communities. The French seigneurial landholding system was instituted, whereby a few seigneurs owned all the land and the habitants paid an small annual rent. Few men were rich by colonial standards, and no one by Parisian standards. Thus differences in rank meant little; feudal dues were a modest burden on the habitants. Bishop Laval secured for the Church huge seigneurial land grants as well as heavy endowments for the Jesuit order. Education was in the hands of the clergy. The Church insisted on the right to regulate the colony's morals, but it was unable to prevent the sale of brandy to Indians by the fur traders. In 1672 the king appointed an aristocrat Comte de Frontenac as governor of the new colony. Although he was later celebrated by the American historian Francis Parkman as the Fighting Governor, Frontenac antagonized many colonists by his corruption and angered the Hurons by not defending them against the Iroquois. Recalled in 1682, Frontenac left an internally divided and poorly defended colony but when fresh Iroquois began and war with England started again (King William's War), he was reappointed as governor in 1689. He sent mixed Indian and French raiding parties to raid English settlements in New England and New York. The women and children were kidnapped, the men tortured and killed. The enraged English colonists retaliated in force. In 1690 a fleet from Massachusetts captured Port Royal in Acadia. English attacks on Quebec and Montreal were defeated, however, and the French seized most of the English fur trading posts operated by Hudson's Bay Company posts. Peace was concluded with the English in 1697 and with the Iroquois in 1701. By then it was clear that New France was a minor pawn in the great game of European power politics. In the early 18th century the American colonies experienced a population explosion, accompanied by rapid economic growth. The shortage of land forced young men to the frontiers, west and north, near New France. During the War of the Spanish Succession (1702-1713) the British again captured Port Royal, which had been returned to France in 1697, and attacked Quebec. France lost the war and the Treaty of Utrecht in 1713 gave the British possession of Hudson Bay and Acadia, which was renamed Nova Scotia. Having lost most approaches to the St. Lawrence, the French strengthened their defences and threatened Nova Scotia and the Newfoundland fisheries; the English responded by intensifying their pressure all along the frontier. The English Fort Oswego, on the south shore of Lake Ontario, challenged French territorial claims and threatened their fur trade. French forts at Crown Point and Ticonderoga, south of the St. Lawrence, blocked a British invasion by way of Lake Champlain and the Richelieu River. In the far northwest Pierre La Vérendrye built a string of fur trading posts in the 1730s that stretched across the prairies as far as the Saskatchewan River, challenging the Hudson's Bay Company's westward thrusts. In the context of the Seven Years War raging in Europe, the British attached major importance to the capture of North America from the French. The great battle on the Plains of Abraham in 1759 was won by the cleverness of British General James Wolfe (1727-1759), who was killed as the British surprised and captured Quebec city; the French commander marquis de Montcalm (1712–59) also was killed. The conflict was not over, for at the battle of St Foy in 1760, the French beat the British and again laid siege to Quebec. The siege failed and, aided by the Royal Navy, the British were finally able to force the French army back to Montreal and capture Quebec. The Treaty of Paris in 1763 ratified British control of New France, now renamed Quebec. New France had a well-established social order, based on a system of seigneurial tenure. It was a diluted form of European feudalism without any rich aristocrats. In Canada, the seigneur owned the land and the habitants (tenant farmers) paid him annual rent. He lacked the political powers of the landowners in France and England, and operated on a much smaller scale than the manorial lords in upstate New York. The habitant family was typically self-sufficient and independent. Nevertheless, the seigneurial system was very effective in establishing cohesive settlement along the St. Lawrence. Catholic religious orders provided the colony with a modest degree of education and medical care, while the Church tried to enforce its strict moral code that prohibited drunkenness, gambling, and sexual improprieties. The government mirrored the absolute monarchy in France. The colony was administered by a governor (a military officer who was responsible for external security), an intendant (entrusted with civil affairs), and a sovereign council (composed of these two officials, the bishop, the attorney-general, and several aides). Individual citizens were allowed to appeal personally or through their patron to members of the government for redress of grievances. Before 1800 priests and the faithful had created a universe in the wilderness marked by the pervasive presence of the supernatural, which they tried to influence by means both orthodox and magical. God was considered omnipotent, the source of benedictions and punishment; but the people, and to some extent the clergy, attributed much power to magic and the Devil. New France enjoyed growing economic prosperity during the first half of the 18th century. The seigneurs, augmented their rents by financing the fur trade and operated inns, gristmills, trading posts and other small enterprises. An iron forge opened near Trois-Riviers in 1738; it was soon taken over by the government which leased it to local entrepreneurs who remained in business for over a century providing stoves as well as horsehoes iron bars for blacksmiths to use. The colony received revenue both from the fur trade, which was the major economic activity, and a subsidy from Paris. Although mercantilism (the idea that the colonies existed for the material benefit of the mother country) dominated economic thought in Paris, the Crown used subsidies to promote the economic development of New France. Farming, particularly the cultivation of wheat, was strongly encouraged. Shipbuilding, iron mining, lumbering, and commercial fishing all became important. The population grew steadily but totalled only about 65,000 in 1763, all descended from about 10,000 immigrants. By contrast, the American colonies to the south had more than two million inhabitants. Quebec's final years under French control were ones of repeated wars, with inflation and administrative corruption compounding the hardships of the people. Wartime dislocations hindered agricultural production, causing severe food shortages on some occasions. This page was last modified on 9 April 2019, at 13:14.